It was a couple minutes after 2pm when we got out to the car, and the meter had about 10 minutes remaining on it, so the timing worked out pretty great! Our campground was just under 10 miles away, so it took us less than 20 minutes to get there, although we did have to pay another 75-cent toll. 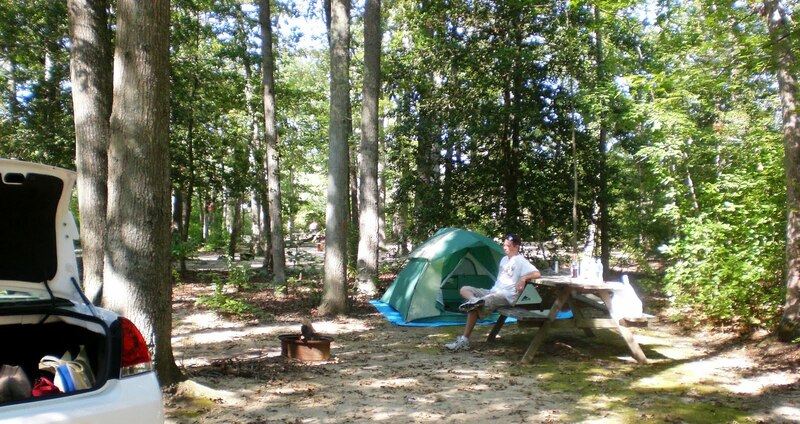 We checked-in and realized this was no ordinary campground. It was in a park... a park with a playground, grills, a petanque/bocce court, and about 50 campsites. We found ours after a little bit of searching, and weren't thrilled, so we scouted out the surrounding areas. Jonathan went to ask for a switch to an adjacent site, and his request was granted. 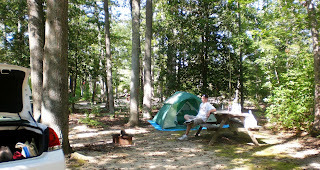 We put up the tent, moved the picnic table, set-up our sleeping bags, and planned out our meals. We went off to the grocery store to pick up breakfast for the next morning and some supplies for some late-night s'mores. We considered making dinner over the fire, but we had absolutely no supplies with us so we'd be unnecessarily buying stuff for no real reason. When we got back from the store we took naps. We got up and headed to find food. We found the Shore Diner and the place was packed! Luckily we got seats at the bar, otherwise we would have had quite the wait. I ordered a turkey BLT wrap with mashed potatoes while Jonathan went with a steak. The steak came with a cup of chicken orzo soup, two rolls (one airy and one with brown sugar), a baked potato, and mixed vegetables. Needless to say, he had a ton of food. The size of my wrap was also enormous - I took home half in a to-go box! The wrap was real turkey and thick cheese, but the honey mustard dressing was a bit thin. The mashed potatoes were pretty average. Jonathan found his soup and the rolls average, but really liked the potato. The steak was a little undercooked (more medium-rare than medium), but he said he liked it. He only had a few bites of the vegetables (broccoli, carrots, cauliflower), but with everything else in front of him, that was probably a good call. We drove back into the city and parked at Caesar's. Earlier in the day we had stopped at Showboat and picked up reprints of our Total Rewards cards (that we originally got when we went to Harrah's in Vegas), since we hadn't thought ahead to bring them. When Jonathan got his, they gave him a free parking slip, good at several of the casinos. We walked through Caesar's a bit, used $10 of free play he had also received, and then made our way out to the Boardwalk. There were a ton of birds or bats (never could figure out which) in the sky in a few places, and we walked far enough north to get a few shots of the rides lit-up (we had already agreed that we weren't interested in going out on the steel pier to ride any of them). We also wanted to try a bit more of Boardwalk cuisine, so we decided on some zeppoles, which are like donut holes with powdered sugar on them. They're kinda like teeny beignets, so we bought a dozen for $3.50. They were fried right in front of us and we had to wait several minutes in order to enjoy them. They're pretty doughy and not as delightful as beignets, but they're still good. On a whim, we walked through Bally's and the Wild Wild West casino. I was thoroughly impressed with the theming there! Even the bathrooms were fabulous! I'd totally recommend staying there to people, since they also have a 24-hour happy hour. They had a giant Wheel of Fortune section (giant as in the wheel was huge; they only had 5 machines), and we watched several people win some big money. We put in (and then lost) $10, but we were up to $15 at one point, LoL. 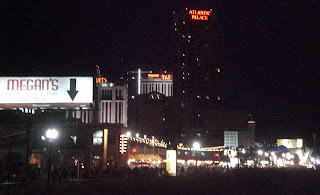 Heading out of Atlantic City to get back to the campsite was a pain... there must have been a bad accident or something, since there were a ton of police cars, ambulances, and fire trucks all heading to one area. We navigated around it and got to our campsite shortly after midnight. Jonathan built a fire while I shooed away some spiders (this campground was a daddy long-leg haven), and we had s'mores and roasted some marshmallows. We were kinda happy with how well everything worked out, but I was dog-tired when we finally went to bed. Turns out that we lucked out on our spot... the shade allowed us to actually sleep past the 7am-sun-is-in-your-eyes point!